Legna Seville Bedding by SDH Linens | Bedside Manor Ltd. 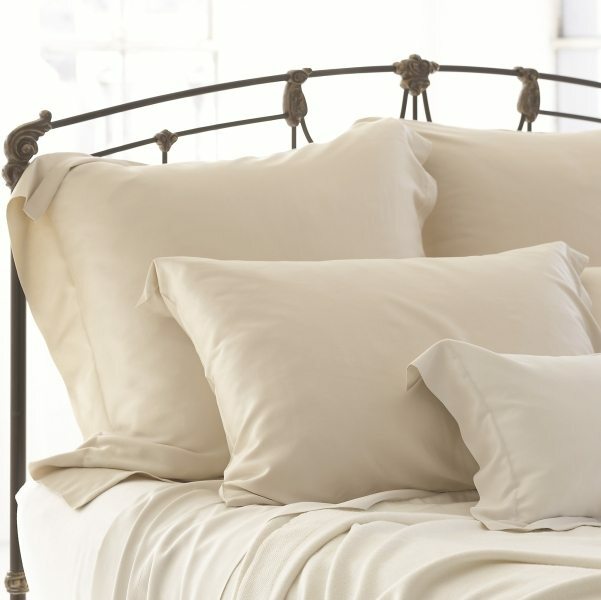 The Legna Seville by SDH linens has a very subtle beauty. Like the rest of the Legna items, this collection is made from 100% Italian wood fiber. The sweet detail is similar to 17th century iron workings. This luxurious product is made with quality products that are made to last. Boudoir Case/Sham: 12" X 16"
King Case/Sham: 21" X 37"
Queen Case/Sham: 21" X 31"
Standard Case/Sham: 21" X 27"
Twin Duvet: 63" X 87"
Cal King Fitted Sheet: 72" X 84" x 13.5"
King Fitted Sheet: 76" X 80" x 13.5"
Full Fitted Sheet: 55" X 75"x 13.5"
Queen Fitted Sheet: 60" X 80"x 13.5"
Twin Fitted Sheet: 39" X 75"x 13.5"
King Supreme Fitted: 76" X 80"x 17"
Queen Supreme Fitted: 60" X 80"x 17"
Cal King Supreme Fitted: 72" X 84"x 17"
F/Q Supreme Flat Sheet: 96" X 110"
King Supreme Flat Sheet: 112" X 110"
F/Q Flat Sheet: 90" X 102"
Twin Flat Sheet: 70" X 102"